Rent direct from local owners who live on-island - not a management company. FREE LONG DISTANCE AND WIRELESS INTERNET. Enjoy sunny South Maui in our lovely studio top floor condo at the award-winning Grand Champions Villas. Our studio has been renovated with modern tropical furnishings, new bathroom, private washer/dryer, private lanai and upgraded kitchenette facilities to include a larger size fridge (with dedicated freezer), and kitchenette sink. Most striking about this unit is it's affordability considering the Wailea location and the amenities included. This rental is located walking distance to many of Maui's most pristine white sand beaches. There is a three-and-one-half-mile paved beach path that fronts five-star hotels for morning exercise or evening sunset strolls. If your heart desires to just lounge about, there are two gorgeous pool and whirlpool spa areas that also have gas barbecues and shaded tables for pool-side dining. We also own one other studio unit and two one bedroom units at Grand Champions. 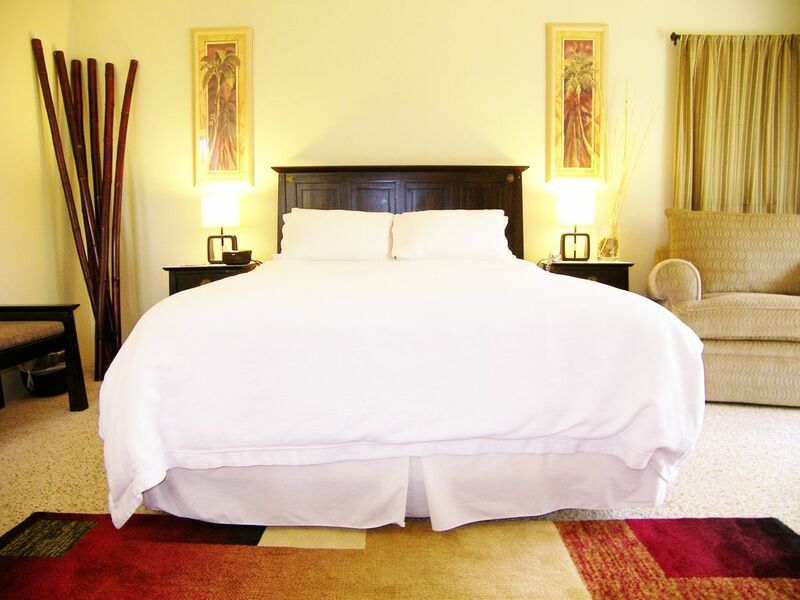 These beautiful accommodations are only two minutes away from the Shops of Wailea. Three renowned championship golf courses and 11 tennis courts surround the Grand Champions Villas providing preferential rates to our guests. We have enjoyed owning at the Grand Champions Villas due to its lovely grounds, pool areas, and proximity to the wonderful beaches in Wailea. We live five minutes from our properties and take great care to ensure our guests are happy. If you need anything while you are staying in our condos we are here to help you. World Class golfing only minutes away. Wailea beach just down the hill. Reps personal training gym adjacent to the property at the Wailea Town center. Many fantastic restaurants only a couple of minutes drive from the condo. Joe's Bar and Grill (one of our favorite restaurants) located right next to the property. Garden View of a lovely tropical forest ravine. Nice owners. Nice place. Lots of amenities. Great location on the beautiful island of Maui! We had a wonderful stay in Maui at Tamara and Steve's studio unit. The bed was very comfortable and the tropical view from the lanai was very private. We slept with the slider open so we could be serenaded by the myna birds each morning. The studio was clean and well stocked with everything you would need for a lovely breakfast or lunch on the lanai. It is conveniently located to several beaches and the pool was perfect after a long day of sightseeing. Parking is not always right by the building, however, we always found a visitors spot. Hopefully, we will have the opportunity to stay here again! My wife and I had a wonderful stay. The views from Grand Champions are amazing. It's a short walk to the beach and plenty of shops/restaurants. The pool is really nice and it has bbq's. Our stay was relaxing and coming back to the unit was a nice way to end the day. The kitchen is just counter with a microwave and a fridge in the closet. But, my wife and I eat out mostly so it didn't matter. Overall, it was a great stay. Well maintained - had everything we needed. The studio was perfect for us. The complex is in a great area and close to fantastic beaches. The condo was nicely decorated and the bed was super comfy. We appreciated having a washer and dryer in the unit. We will be back! We stayed in the unit for 9 nights and enjoyed our time there. The unit was clean and well maintained. The property owners were easy to communicate with, were quick to respond and dealt with requests quickly.